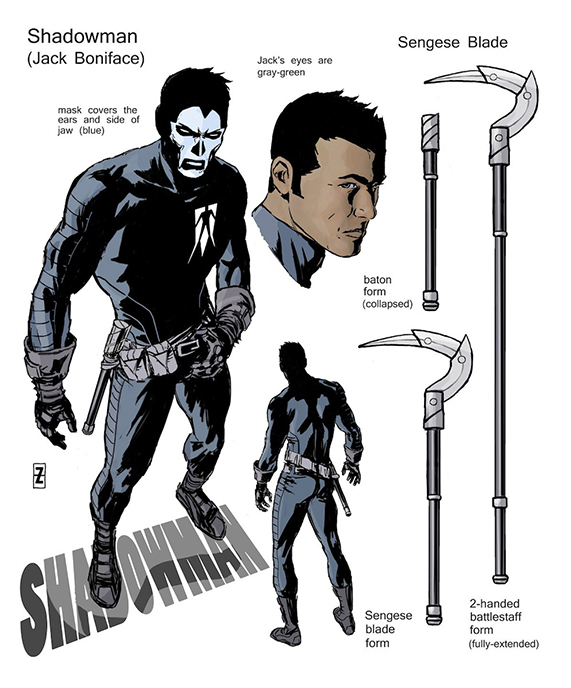 There have been a number of designs for the new Shadowman or those who have held the mantle over the years. Now that Valiant has provided us a detailed sketch of the redesign we believe it’s time to revisit the looks of old before we dive into the new and improved digs for 2012. First up was the original costume. 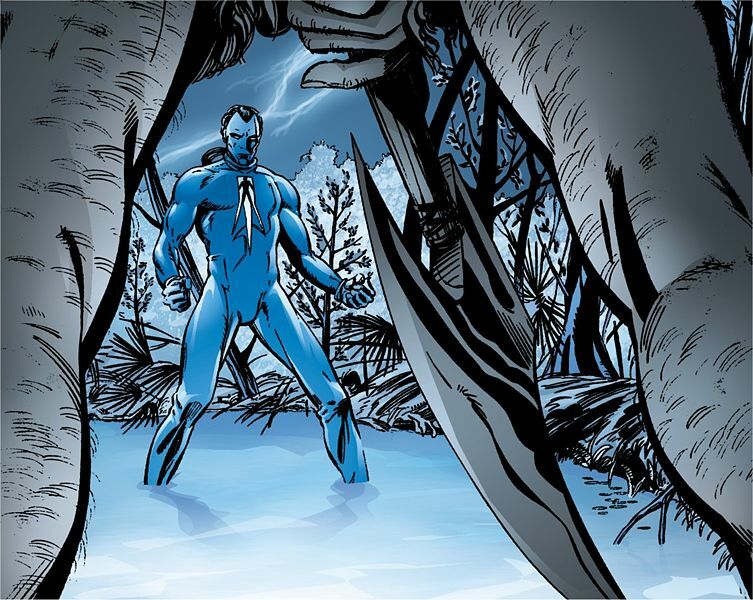 A Pure blue body suit- it covered Jack Boniface from neck to toes for complete identity protection. Old Jacky even pulled his hair back into a ponytail for a very conventional superhero look with the Shadowman symbol em-blazed on the chest. Unfortunately for Jack this suit had no other benefits as it caught flame, got torn etc on numerous occasions. Eventually Jack moved on from the “superhero” motif and took on a more practical look. The Dirty Biker Look. 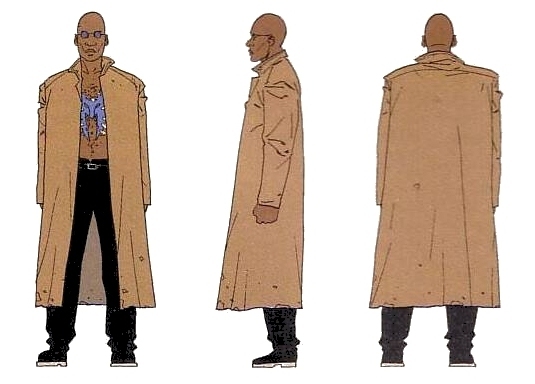 What can be said about wearing civies before Luke Cage made it popular? Classic! This is how I remember Jack Boniface. Leather Jacket, black shirt with the Shadowman emblem and his hair just everywhere. By the time Jack took to wearing this one he had grown pretty confident in his abilities and knew the limitations of his powers. Again the suit offered no additional protection and he occasional wore this one with and without the jacket. Still my favorite Jack Boniface look! 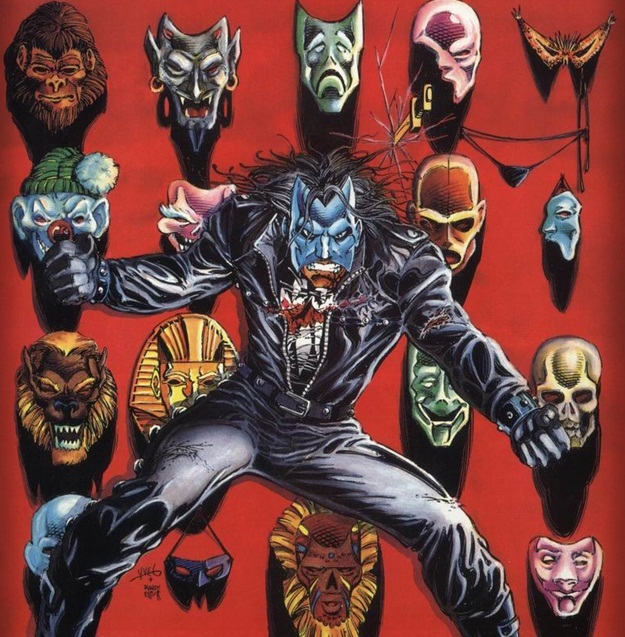 When Acclaim took over Mike Leroi became shadowman and he also had two distinctive looks. The first was this “Zombie assassin” duds. The mask of shadows was literally affixed to his chest by way of magic in a grim and horror movie kinda way. Mike often wore his shades and simply a pair of jeans. Nothing fancy just work clothes. 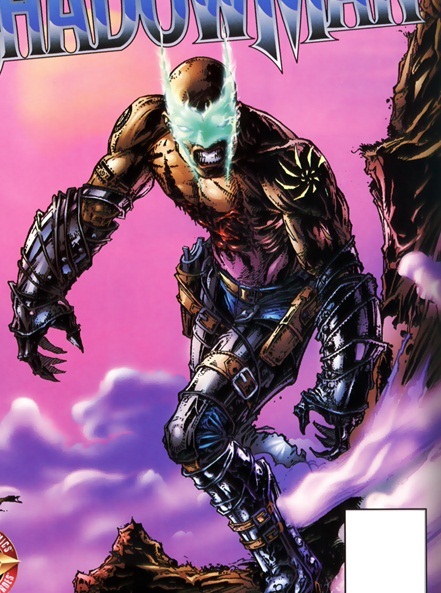 This is still to this day the most popular shadowman look thanks to the videogames, but not one of my favorites. That brings us to the re-imagined Jack Boniface and his new all black all business costume. Gone is the Mask of Shadows of yore in it’s place is a Dr. Voodoo inspired white skull face paint, a padded bodysuit that covers right up to the neck, pouches for an assortment of gadgets and weapons reminiscent of Batman’s utility belt and my favorite new toy, the collapseable Sengese Blade. Now this bad boy I can’t wait to see in action! Baton, Blade and battlestaff modes already have my fanboy heart racing at the possibilities. Hands down this is the most practical approach to fighting demons and criminals of the bunch. I love it! Expect more as it breaks as we gear up for the November return of Shadowman from Valiant Comics! The fourth and the fifth are the BEST !